SCP-1819-1 at time of acquisition. Instances of SCP-1819-X must be contained and studied under level 3 biosafety conditions. Access to documents produced by instances of SCP-1819-X (such as writings, drawings and audiovisual recordings) requires clearance level 4 or approval from Dr. Ripoli. Personnel assigned to instances of SCP-1819-X cannot be re-assigned to other projects involving children and should avoid interactions with children from the general population. Description: SCP-1819 refers to a medical condition that develops in human children between 4 and 13 years of age. Affected individuals are characterized by abnormal cutaneous sensitivity to the absence of visible light. Sporadic cases appear in individuals designated SCP-1819-X (where X is a number). Initial symptoms typically manifest during periods of more than 4 hours spent in darkness (hereby defined as less than 0.1 lux, but this threshold varies between cases). Symptoms include pain, itching, edema, blistering and peeling of skin, and are usually diagnosed as sunburn. The severity of these symptoms increases gradually with longer or repeated periods spent in darkness. 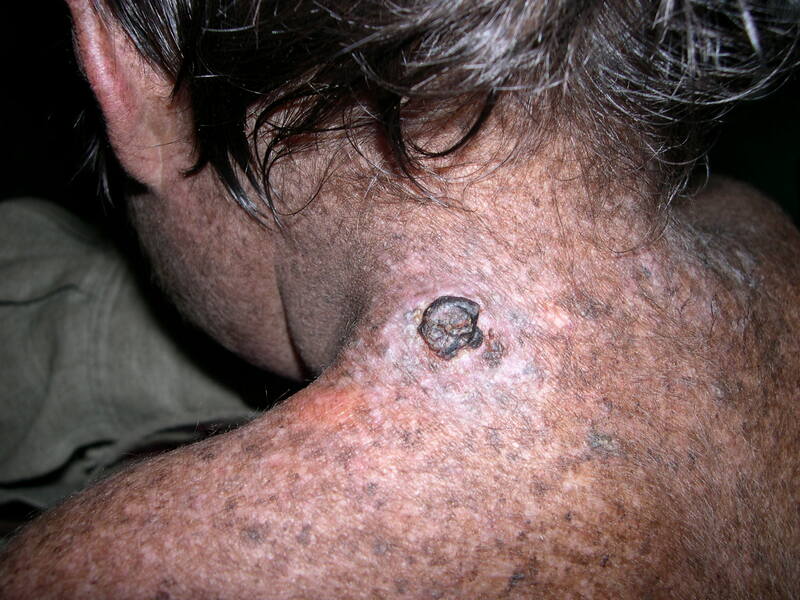 Instances of SCP-1819-X also have an extremely high incidence of cutaneous neoplasias and usually die of malignant melanoma before puberty. Genome sequencing revealed a novel type of retroviral elements present only in affected skin tissues. These sequences contain a single functional gene that encodes an enzyme, referred to as SCP-1819-E. This enzyme was shown to catalyse the formation of pyrimidine dimers, a genotoxic modification of DNA normally induced by ultra-violet radiations. Visible light inhibits the activity of SCP-1819-E by an unknown mechanism. The retroviral sequences do not encode other functional proteins and the subjects do not produce detectable viral particles. Instances of SCP-1819-X manifest a strong fear of the dark (nyctophobia) for years before the onset of SCP-1819. They are also convinced of the existence of a ''boogeyman'' which they invariably describe as a black figure with a single ''bright'' or ''burning'' eye. It is unclear at present whether this persona is a real entity or a mental component of the disease. Instances of SCP-1819-X are contagious to other children. The biological basis for this contagion is unknown, but it requires SCP-1819-X to discuss their nyctophobia with the subject. Physical proximity and direct communication are usually necessary, but contagion was also observed to occur by written documents and drawings. Current data suggests that SCP-1819 has a memetic component, but it is not yet possible to exclude the existence of an undetected airborne vector. SCP-1819 is not contagious to adults. However, instances of SCP-1819-X who survive past puberty remain completely affected and are still contagious to children. Addendum 1819-A1: Excerpt from interviews of SCP-1819-X instances. - Mr. Spiky was always mean, telling me about the monsters in the dark until I cry. My mom said there's nothing dangerous in the dark, and I don't have to be afraid. It's funny, Mrs. Jackson said sunlight can give you cancer and you have to be careful. How come grownups are scared of the sun but not the dark? Mr. Spiky found this very interesting. - Dad always says I should grow up and stop being afraid of the dark. I try to explain about Mr. Spooky but he doesn't believe me. Mr. Spooky is feeling lonely because people don't play with him as much as they used to. But he told me I was a good boy and now he had a gift for me, so I wouldn't forget him ever. He said to share with my friends so we could all play together. - It was burning, the dark was burning, I was crying and Mommy was screaming, and I could hear Mr. Inky laughing. They keep me in the light now, but what happens when you die? Mr. Inky says it's all black. Forever. Drawings produced by different instances of SCP-1819-X before their acquisition.